The Grande Ronde River offers a scenic rafting trip without too many surprises. It's a great introduction to whitewater and perfect for family adventures. Campsites are on beautiful plateaus with wildflowers and grasses. Wildlife viewing, mountain scenery, hiking and good fishing are some of the highlights on this trip. The water is fast-moving and the Grande Ronde's whitewater is exciting but relatively mild. In 1988, recognizing the spectacular beauty and outstanding resource values of the river canyon, Congress protected 44 miles of the Grande Ronde as part of the National Wild and Scenic Rivers system. On the Grande Ronde River, we float through evergreen forests with towering ponderosa pines anchored on steep mountainsides. The mountains and river canyon are accented with black basalt cliffs that were created millions of years ago during the great Columbia Basin lava flows. The river corridor has a complex ecosystem rich in plant and animal life. Where we pass through the heart of the ancient homeland of the Chief Joseph band of the Nez Perce the mountains are replete with wildlife. Elk, deer and black bear may be seen on the upper stretches while big horn sheep are often perched on the cliffs of the lower river. Birds of prey commonly soar and hunt the wooded hillsides and Grande Ronde River. The Grande Ronde comes from a relatively small watershed so it's only raftable in the late spring and early summer. 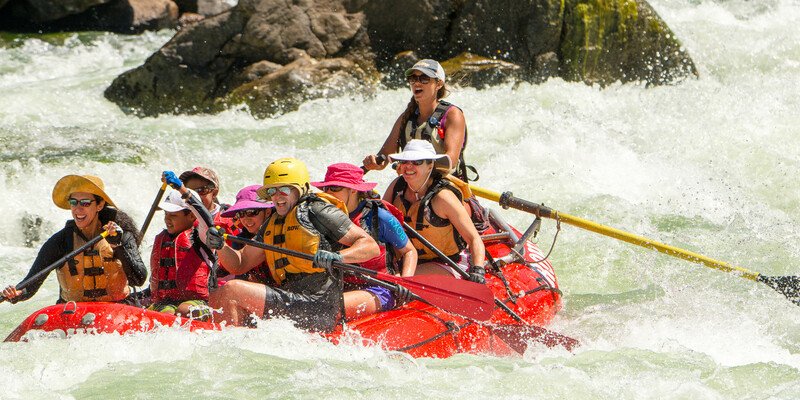 Your white water rafting trip begins on the Wallowa River for a fast-paced nine miles before it joins the Grande Ronde River at Rondowa. In June and early July wildflowers are blooming and the air is crisp and pine-scented. ROW Inc., doing business as ROW Adventures is proud to be an Equal Opportunity recreation service provider. ROW Inc. operates under special use permit from the U.S. Forest Service in the Umatilla National Forest. All our operations and facilities are operated on a non-discriminatory basis. Why go with ROW on the Grande Ronde River? Our itinerary is designed to visit many different points of interest, taking advantage of rock art sites, pioneer homesteads, and natural wonders in the river canyon. Your trip is enriched by knowledgeable guides who share the canyon's cultural and natural history. No other company trains guides like we do, and most of our guides are also Certified Interpretive Guides through the National Association for Interpretation. Our trips support local hotels, on our farewell dinner we eat in a local restaurant, we hire local guides and buy all our trip provisions and food in local communities. This means our trips and the money you pay for them has a significant impact to our local area. Our trips offer an excellent opportunity for our guests to interact with locals, providing a cultural element that allows you to learn more about the American West. The quality of our food reflects the quality of the wilderness environment in the canyon. We hand-select the freshest fruits and vegetables we can find and pack them carefully in huge ice-coolers. Likewise, these coolers carry fresh dairy products and meats. From these ingredients we prepare bountiful, healthy meals. Sustainably harvested wild Alaskan Salmon served with a fresh garden salad; Prime Rib combined with a fresh Chilean salad and Idaho mashed potatoes or made-on-the-river lasagna is a few possible entrees. Big salads of vegetables and fruit add color and variety to every meal. Desserts are made each evening in our Dutch ovens and range from authentic cobbler and pineapple upside-down cake. We serve juice each morning and moderate amounts of bottled wine with dinner. We also provide two beers and two sodas or juices per person per day. There's always plenty of cold water, lemonade mix, tea, coffee and cocoa. You're welcome to bring your own beverages or alcohol as well. We always have plenty of ice to keep your drinks cold.